I immediately squealed with delight!!! Why did she save the best for last? Why was that not the opener?!?!?! “Hey guys, we’re moving to a new apartment with a PINK TOILET!” It probably should be the header on the real estate ad. But I digress…What I really wanted to know was if the WHOLE BATHROOM was pink or just the potty. 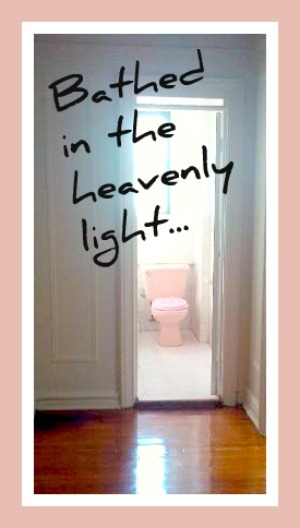 An ex-boyfriend of mine once sublet an apartment where the entire bathroom was pink. Floor to ceiling tiles, toilet, tub/shower, AND sink. It was strangely disconcerting and fascinating all at the same time to be in there. In fact, a couple of months ago I was lounging through the NY Times and they had a whole article devoted to the comeback of the pepto-pink bathroom, read here. There are people out there specifically searching for them! And whats more, spending oodles of $$$ finding these vintage tiles and restoring their bathrooms to their former mid-century glory. Sources left to right, image credits as linked. We renters in New York don’t always have the freedom to personalize our apartments the way we’d like. But why be resigned to something being an eyesore when you can just go with it and make it fantastically your own. Click here for a link to a post over at Apartment Therapy on how to install your own fancy-schmancy toilet seat. Just be sure to take it with you when you move! Or leave a comment below with your wicked awesome toilet seat suggestion! I’d like to say this is a before and after post, but in reality its a “middle” and “middle-r” / where are they hiding all the good lamp shades rant?!?!? Check out the dated before before here. 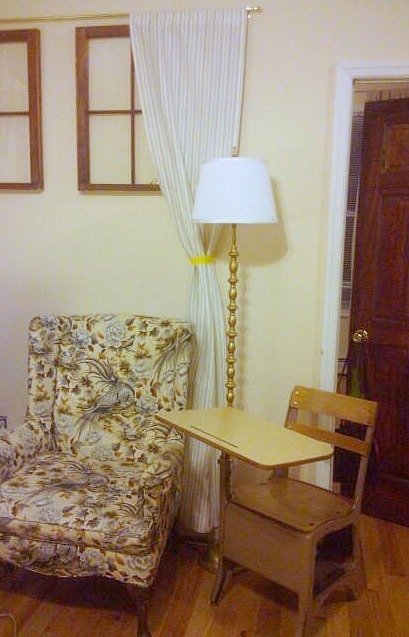 Now feast your eyes on this tall drink o’ water, with her new rockin gold bod and demure IKEA shade. I originally bought the shade thinking I would recover it, but it became a moot point when I got the thing home and realized how teeny tiny it looked on top of its tall thin mama. (It looked bigger in Brooklyn I swear!) I learned to live with it, but it made me feel funny that I could always just see its undercarriage lamp parts peeking out from underneath the bottom edge. On a side note, go visit this site if you want to learn all the proper anatomical names for “lamp parts” so you can stop calling them thingiemagigers and twistiebits. I was fascinated because I love crap like that useless information learning new things, but clearly I have retained nothing. Fast forward to last weekend when I accidentally did it again. Bought a lamp shade that’s all wrong for the lamp. Its this one in the large size from the Thomas O’Brien collection at Tarjjjet. Or maybe it just needs a bunny finial like this one. Honestly, I should probably just start carrying this thing around with me. (The lamp, not the bunny silly!) Like when you’re shopping for the perfect dress to go with “those shoes” or vis-a-versa. 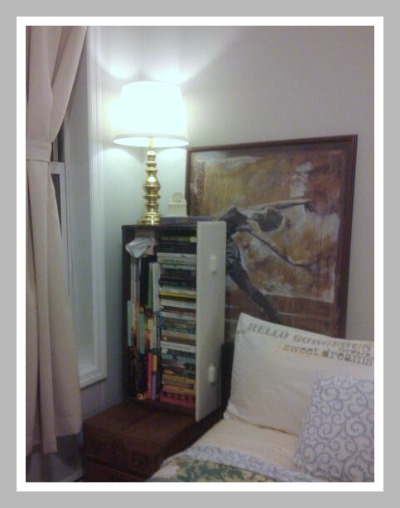 Or more likely in my case looking for a paint color to match that certain tea-cup. And don’t worry, I have no shame, I’ve carried much bigger and stranger things down the boulevard. I MUST get this lamp situation taken care of so it can stop staring me in the face every time I’m watching my stories on the telly! P.S. 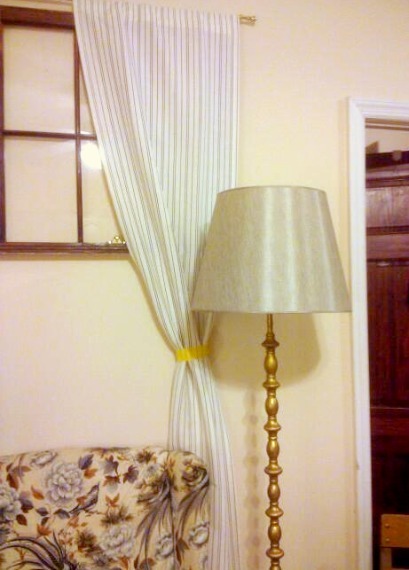 Leave a comment if you’ve got the perfect lampshade source (keep in mind I’m poor, I’ve spent all my money on lamp shades). Or you’ve got an idea to de-shinify this one! Ok bye, gotta go order my rabbit finial get my beauty rest. So check it out. I’m trying to revamp my vanity, because I’m tired of looking at it just sitting there looking all sameness for three years running. It’s the ever popular Narrow-Leg Vanity from West Elm. Click to buy your own. I still love it. It works perfectly to store all my make-uppy things and nail polishes, and those drawers hold a surprising amount of random stuff. Then when its blog time, I can just flip that top down and voila a workspace! I’m just feeling a little blah about its looks. I’ve been wanting to change out the drawer hardware forever because that’s the easy peasy fix, but the draw pulls are 4″ center to center and I can’t find anything I like. Evidently West Elm really wants you to keep the orignal look of their piece by putting non-standard/hard to replace hardware on its stuff. Well too bad. I got serious about the overhaul when I spotted this pic over at Apartment Therapy from an article that ran on NY curbed.com. Something about Jennifer Aniston moving to the West Village, click here to check out the article. P.S. lets pause for such a beautiful photo. (Sorry about my sad cell phone snaps folks). 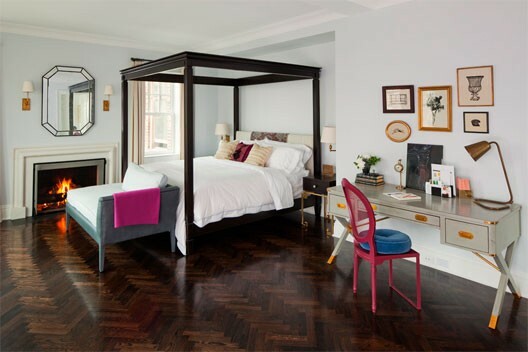 And those FLOORS! Dead, I would never leave. Ok, deep breaths and take your eyes to that desk, I’m positive it costs 9 bajillionmillion dollars. I love what’s happening there, and I immediately filed the image away and began looking for the necessary pieces to pimp my vanity. So there I am standing in the knob and pull aisle on a Sunday morning at 10 am in my 2nd Home Depot of the weekend, and nothing! “Water water everywhere and not a drop to drink!” So many knobbies and things and absolutely nothing for me. Anything I remotely liked (something like this) was only in a 3 inch size. And I’m not even concerned with the finish, as I’m going to gilt it with the gold finish paint left over from this project. 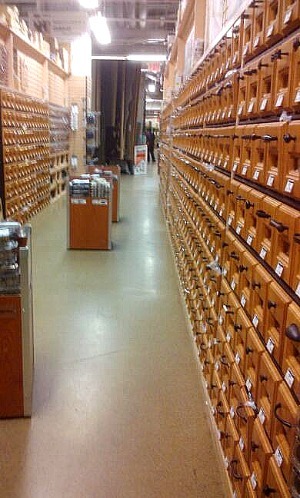 And wouldn’t you know, when you go into Home Depot they look at you like you have seven heads if you ask if they have corner guards “you know like on big trunks, and table corners?” He looked at me with such blank eyes, I snuck my phone with the picture back into my pocket and decided to leave him to his hangover. To the google! So if you’ll excuse me I have to go refine my google search terms. The weekend is only 4 days away! 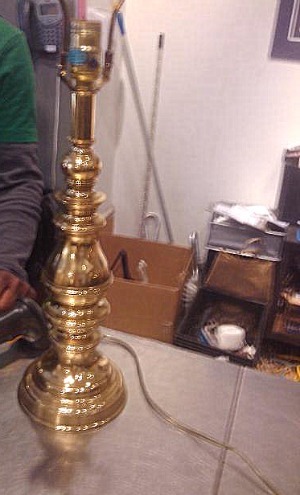 Meet my newest illuminated love, just a little brass nugget I picked up last week on my lunch hour at the Housing Works thrift store down the street from my cubicle. Isn’t he adorable? What can I say, I like his shape, and his heaviness, perfect for the empty spot next to my bed. I know he would totally protect me from intruders. And the best part!?!?! Just 1200 pennies! I slightly suspected that this might be because maybe he didn’t work, and I’ll usually make the thrift store plug ’em in before I take a lamp home, but I got an eye roll when I told the guy that I wouldn’t be taking the shade. And I just couldn’t fight that battle, I didn’t want his negative nancy attitude raining on my own St. Patty’s parade. Good news, he totally lit up like a Christmas tree. Bad news, the little switch on the bulb did not work. No bigs, I just picked up one of those clicky gizmos for two bucks that you attach to the cord that becomes the new on/off switch. After a little finagling and deciphering of some bad instructions and an even worse picture, I got him in full working order. I’m convinced we were totally meant to be together, imperfections and all. Due to the height I chose to place him, coupled with my extreme laziness short stature, I would have needed to move the on/off switch lower anyway! Check out his new home! New shade courtesy of a hit and miss for the living room floor lamp I purchased awhile back (that also got a new shade this weekend, check it out soon). So basically we’re looking at a twelve dollar lamp, two dollars for a new switch and a plain IKEA lamp shade pilfered from the living room. I’m always excited to see his shining physique every time I walk in the room, and feel totally safe sleeping next his sturdy build… plus he doesn’t snore or hog the bed!